When you think of potted containers around your home or garden, did you think it would only be in Spring or Summer? Well, with a bit planning you can have delightful containers around all year. 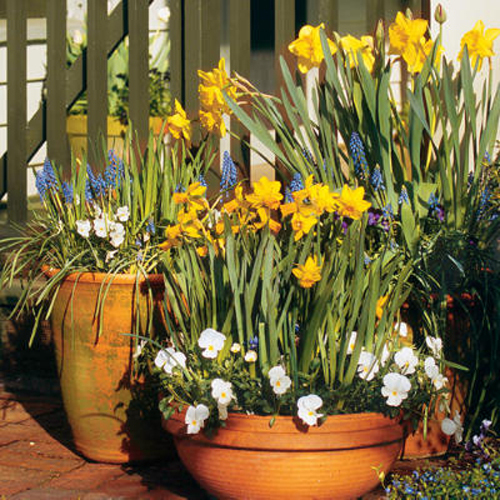 Spring is the time that bulbs burst into bloom and your flowerpots are overflowing with color, texture & beauty. If your patio has staggered pots with bulbs in them, you can create quite the production. Even if there is some early spring rain they will still look smashing. Head to the nursery and find lots of wonderful flowers to pot. 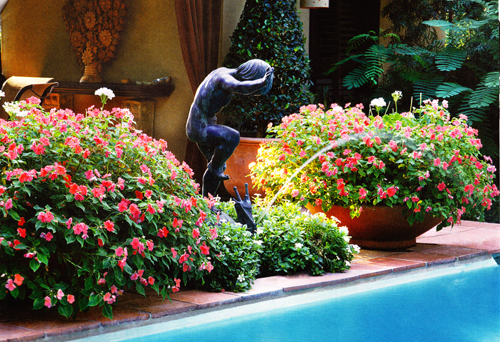 Summer is the season of the potted plants and flowers. Everything is in its colorful prime. Now is the time to highlight your creative skills. Use all one color in all your planters or do you like to mix it up? Go to any garden center and your senses will burst with excitement. Succulents, flowers, plants, they have so much to offer. Use eye catching containers that compliment your foliage choices. Autumn rolls around and your thought process starts to slow down. There are many autumn shrubs that bloom this time of year. 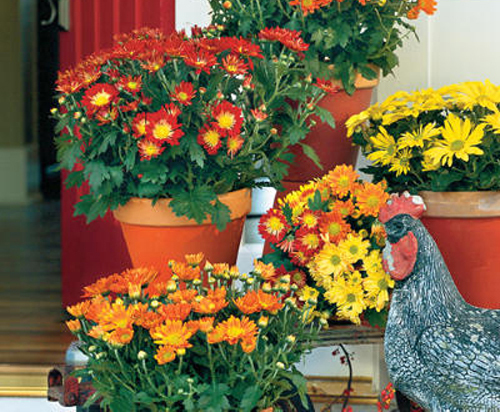 Fill your garden containers with burst of orange, red & yellow. Mums always make a show this time of year and if you fill a large pot with them, they will reward you again with amazing color. Now is a time to use berries in pots. They will add charm and color to any autumn grouping. Surround your planters with gourds & bright pumpkins and show your holiday spirit. And then comes Winter. There are winter flowering shrubs the will look lovely in your pottery. 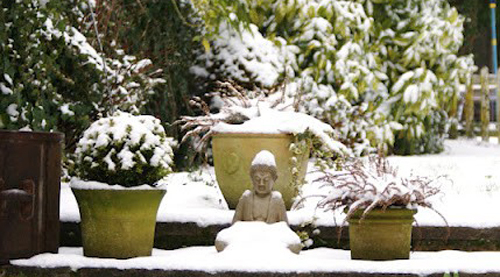 Now is the time to make sure you are using poly resin, concrete, sandstone or high fired glazed pottery that can stand the cold. Put up some evergreens which look lovely this time of year when dusted with snow. Plant a pine or spruce tree and add Christmas lights to bring some excitement and light to your garden or patio area. There will always be 4 seasons and only one you. Don�t let a season go by without planting in your garden containers. Read more.....Pet proof your potted garden. Read more.....Let's clean your garden containers.